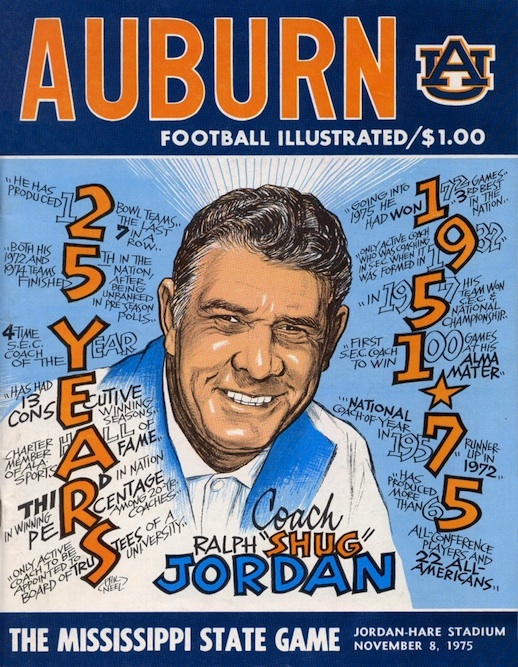 The cover for the 1975 Mississippi State program was of the very few Neels that didn’t feature Aubie. I don’t think people missed him. For in his place was Saint Shug, smiling, celebrating his 25th coaching anniversary up in cartoon heaven, the “only active coach to be appointed to board of trustees of a university,” which you know because of the first “S” in “trustees” helps form a giant, expertly executed acrostic of accomplishment. It’s a masterpiece on par with Trey Johnston’s same year-ish tiger of a Shug mural. Frankly, I’m a little disappointed it isn’t already on Lee Ziemba’s back. Cover courtesy Clyde Kingry. You can check out our growing Phil Neel archives here.